TAKE THE BRAN OUT OF YOUR MASH. Internationally acclaimed Speedi-Beet and Fibre-Beet have helped pave the way to a new understanding of equine nutrition. Low in sugar and low starch, Speedi-Beet and Fiber-Beet can now be found in numerous feeds and treats like Emerald Valleys Beet Treats, SuperMash, SavvyMash and now SpookyMash. Created by Emerald Valley, our mashes have been designed as both a treat and a nutritionally superior feed. The combination of oil, sugars and fibers has been calculated to give the correct energy profile for the horse. Sugars, including starch, sucrose and fructose, are limited to ensure minimal amounts reach the hindgut to avoid negative fermentation products. The fiber levels, however, are high and encompass the optimum profile of celluloses, pectins and soluble fibers. This allows fermentation to occur along the whole of the digestive tract, which encourages growth of the right microbes throughout the tract, the probiotic effect. 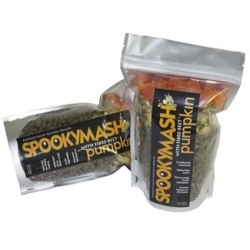 SuperMash, SavvyMash and SpookyMash provide both rapid and slow release energy, optimizing bio-chemical pathways.